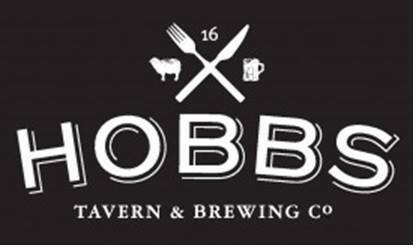 A Staple in the Gateway to the Mountains: Hobbs Tavern & Brewing Company | Favorite Foods, Inc.
Hobbs Tavern and Brewing Company is a unique landmark for West Ossippee folks and those who travel up to the White Mountains. The modern, yet rustic brewpub has been opened since April 2014, with three business partners as the force behind the complete renovation of the building and the birth of a new restaurant. Owners Rob Finneron and Ash Fischbein go back to 2001, when they worked together at a few spots in Wolfeboro, NH. Fischbein became busy building another business, a meadery called Saphouse Meadery, “that got to a point where I had to leave the restaurant business and went to that full time.” He then focused on the meadery, but five or six months went by and he reconnected with Rob, and talk began of starting a restaurant of their own. The previous owner was struggling at the location, and the team thought it would be a shame to let it disappear, so they jumped on the opportunity to purchase the building. Finneron and Fischbein had the same willingness and drive, all they needed at that point was the money, which came from their third partner, Nathan Deyesso, who wanted to team up after being a customer of theirs up in Wolfeboro, “if you don’t have the money, you find someone else who does and find someone who is willing to invest in you,” and Nathan was that for them. The team spent months completely modernizing the building. The idea was to start a brew pub, making their own beer, so they renovated one side to become their brewery, “we’ve built an excellent team over the last two and a half years, to get to where we are now, and I think right now we have the best of the best,” Fischbein told us. He equates it to high school, “we’re in our junior year, we finally got the lay of the land, we know where the lockers are, we’re not as awkward as we’ve been in the past,” he joked. “We’re not spinning our wheels, we’re gaining ground, we’re gaining market share with our beer…it’s really about team and staff development, and to continuously be relevant in our market,” Ash told us. Saphouse Meadery is still alive and well. “We’re in 120 stores in New Hampshire and 700 stores across the country.” As you can imagine, Ash doesn’t sleep much between the two businesses. On top of continuing to produce their beer, the team is formulating some of their favorite sauces and dressings that their guests love, focusing on branding and getting everything finalized, “We’ll be kicking off somewhere in the first quarter, we’ll have various sauces in store shelves and farmers markets and things like that,” Ash let us know. The team is also in the process of installing a canning line for their beer. Until now Hobbs beer has only been selling in kegs to bars and restaurants, and they’re in about 20-30 stores rotating amongst other craft beer, “it reaches as far south as Portsmouth, up to North Conway, over to Plymouth, even down to Manchester, we cover the entire state,” Ash told us. The cans will open a new network and expand their reach to the other corners of the state. Between the owners, they have about 60 years of experience, and they’ve previously owned other businesses over the years, so it’s not their first time at buying, building, renovating, envisioning, and pursuing a business. “The landing is harder than the take off,” Fischbein spoke about starting up a business. On top of building a business, they’ve been busy building a dream team. “We’ve really just been team builders”, Fischbein enlightened us. Just like you have a chef managing a kitchen and a general manager at the front of the house, their brewery has its own team, a brewer and sales person, and another person it the brewery in charge of several systems, and Rob and Ash overseeing it all. “We’re all foodies, and we all love good beer, so having something to compliment the beer is certainly a priority, and honestly letting the guests tell us what they want,” Fischbein mentioned, referring to the creation of their menu. The team took the time to determine what customers were asking for and what they like, and that’s where there menu is derived from. They took the staples of Hobbs and then added to it, “if it doesn’t work they can always change it.” Executive Chef Jason Baum, an essential part of the Hobbs team, told us. He reads a lot of other menus in the area to ensure theirs isn’t the same because they want people to choose them based on what they have. “We get pretty creative in the kitchen.” Baum says. Going from cities like Boston and Portsmouth to Hobbs Tavern was a bit of a shell shock for Chef Baum, but he has adapted his own style to what works for the guests there, while keeping a creative spin on everything to stay unique. “Stuff people don’t see around there, but not too over the top, enough to make people say ‘wow this is very different,” is what they want when guests come to Hobbs. “You’ve done a fine job at taking a fine dining background and fine dining experience and putting it into a pub food environment,” owner Rob spoke about Executive Chef Baum. 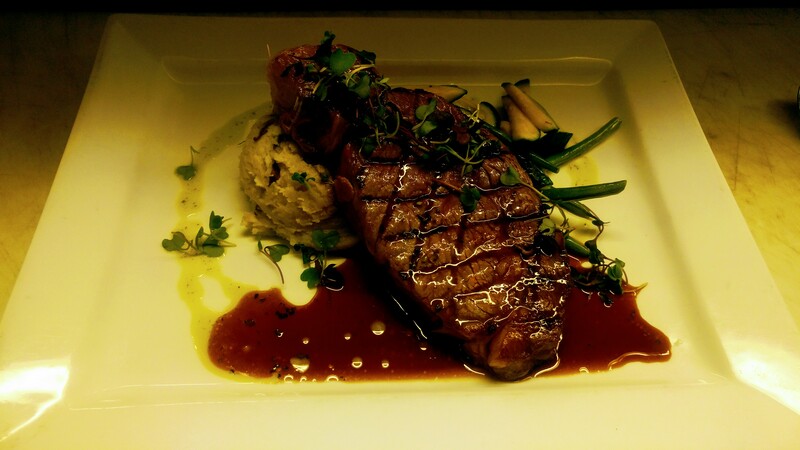 “Everything is very approachable,” Baum says about the Hobbs menu. “Our beer is so good here, it’s just great craft beer, we’re trying to elevate food to that same level, it’s a destination for people, people come here for a reason,” Baum says happily. 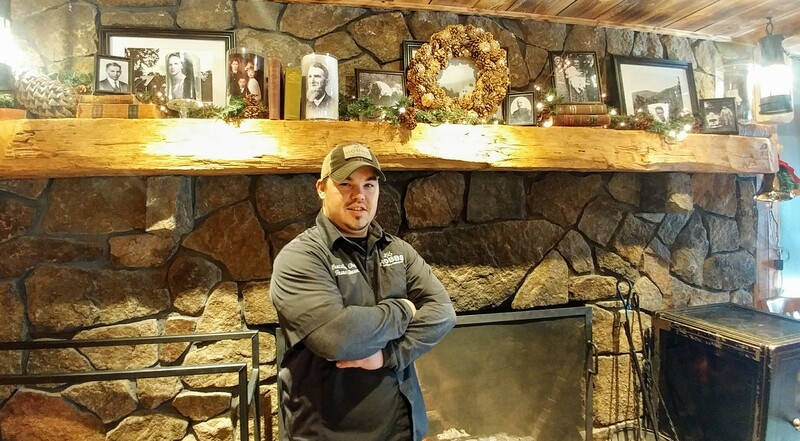 He compared finding Hobbs to going away to college and then coming back to find home, “that’s what it was like for me, to find home at Hobbs.” When Chef Baum saw the building, he saw all the potential it had to grow, and his goal was to not be the same as everybody else; “to set apart, but not too far apart. We don’t have to reinvent it, we just have to make it better and more interesting for people.” Baum later went on to say, “We’re not afraid to try something new, by any means, if it doesn’t work, we fix it and look at the next thing we can do.” His goal as a chef is to make the best food they can for the guests of Hobbs. It can be very expensive and very hard to make good beer, but they’ve managed to make it work by having the right team. The team just brought in a new brewer, Randy Booth, a New Hampshire native, who worked out in Colorado, where he trained under a couple brewers and got some west coast influence, then came back to New Hampshire. “He did everything he could to make the best beer he could with the knowledge and tools he had.” Fischbein spoke proudly. They team says they’re blessed to have the opportunities that they’ve had. “In my world it’s about the law of attraction, surrounding yourself with people that are like minded and have the same energy and drive,” Fischbein told us. He goes on to say that they truly couldn’t have done it without each other and the knowledge each has. Hobbs is open year-round and, despite New Hampshire being a seasonal state, they do well in both summer and winter months. Snowmobilers are always in the area on the weekends in the winter, driving business to Hobbs. “This year, it’s going to be a good year,” Fischbein affirmed. “I hope all the surrounding businesses have a great year, we all help each other in so many ways, it all works together.” In the summer they have about 60-70 employees total, and about 30-40 working at one time, “it takes a lot of guys to get this place going,” especially with their huge, hotel sized kitchen. As far as work-life balance, they all make it work and are lucky to have families that understand why they do what they do. Chef Baum tells us, “if your heart is into something so much, then you find ways around it, that’s how I see it.” His wife understands what he does and why he loves doing it. They make time. “You can always make it, may not always be the best time, but you can make it happen”, he says. The little time Fischbein has left after his long work hours, he likes to give back. He helps people with disabilities learn how to ski in the winter and in the summer he teaches them how to mountain bike. As far as Hobbs as a whole, they have donated $12,000 worth of gift certificates, they’ve given away hundreds of pounds of food, and now they’re doing beer dinners that have non-profit benefits for different programs and associations, “we’d like to continue going down that path where we can raise money and be a part of the community, that’s in my blood, doing whatever we can.” Fischbein tells us. The team is hoping to expand upward, with the unveiling of their canned beer, sauces, and salad dressings, and keeping focus on brand awareness. They have put hundreds of hours into the place, so they want to keep building upon that to continue to make all those hours worth while. “Whatever we can do to make it more attractive.” The team is always working on what they want the place to be, “when you and your family are driving by, where do you want to stop?” They are always striving every day to be that destination.